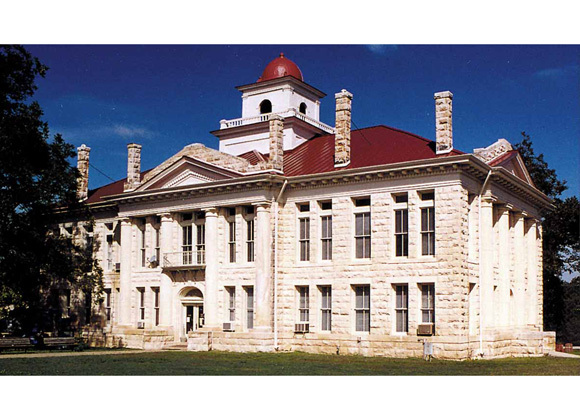 Blanco County Courthouse - Volz & Associates Inc. This rough-hewn limestone courthouse was designed by San Antonio architect Henry T. Phelps and constructed in 1915, twenty-five years after the county seat was moved from Blanco to Johnson City. Over the years, the austere interior of the building developed multiple cracks and water damage from roof leaks. Structural analysis indicated that the tower, supported by the roof trusses, had severe settlement issues that posed a potentially life-threatening situation. Volz & Associates coordinated the installation of emergency steel supports through the courtroom ceiling to brace the failing structure. Using heavy-duty jacks, the tower was carefully raised while the undersized original trusses were strengthened and reinforced. While the structural work progressed, the County took the opportunity to reconstruct the original vaulted pressed metal ceiling of the District Courtroom and to install new lighting.